8 ways rabbits return to you more than they take. 2) "Have you priced rabbit meat lately? $30/pound?!? Heck, for that price I'll raise my own meat!" While a few pet rabbit owners might be horrified at the idea of eating rabbits, our long-running rabbit survey has shown us that the vast majority of all rabbit owners, including pet rabbit owners, have no problem with the idea of eating livestock rabbits. The good news is that it only takes a few rabbits and minimal space to provide for the needs of an entire family. The urban dweller can easily raise a few rabbits on a covered patio or in the back yard. These Rex rabbits will reach market weight in approximately 10 - 12 weeks. 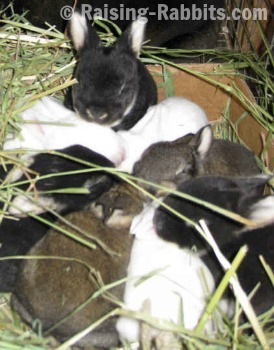 New Zealand rabbits are larger as a breed and faster growing; they'll go to market by 8-9 weeks. You will need a significant time investment. You’ll need to feed the rabbits at least once a day, plus maintain a regular schedule for cleaning cages, and other daily rabbit husbandry chores. You will need to put some money into those rabbits. They’ll need cages and feed, at the least, though alternative forages and housing choices exist. You may encounter a learning curve, which is where we come in. 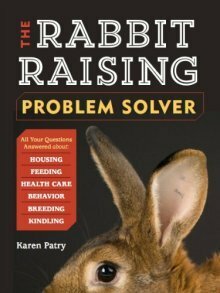 Raising-Rabbits.com is designed to provide you all the information and education you need to accomplish the whole gamut of rabbit husbandry chores. You should plan on swearing off pesticides and herbicides, especially if you want to save money by feeding yard scraps and grass clippings. There are other non-toxic ways to deal with weeds. What do you get for your efforts? A single healthy doe can provide 6-10 live rabbits per litter, and sometimes more. That translates to up to 30 pounds of butchered meat per litter. Multiply 30 pounds times 7 litters per year, and you will have stored away or eaten up to 210 pounds of lapin, per doe, per year. Multiply THAT by the number of does, and…wow, it adds up fast. Rabbits and their various products also provide meat and tangible goods for use in bartering, should the need or opportunity arise. 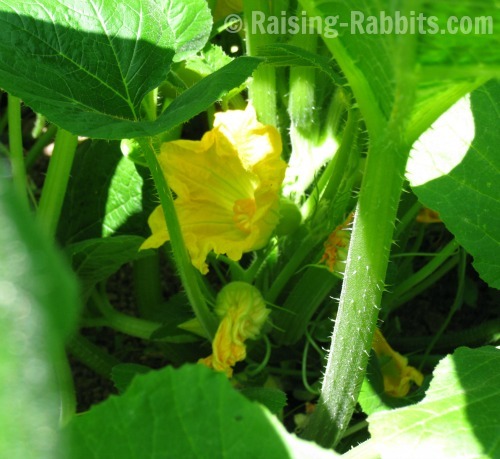 Below: Crookneck squash growing crazy in rabbit manure, showing interdependency of species. The rabbits eat the plants and then fertilize the garden. Humans nurture both the rabbits and the garden, and also eat from both the herd and the plants. http://www.peninsulanewsreview.com/news/167912285.html - This news article features a Sidney BC, Canada, resident who manages to provide nearly all the vegetables his family needs in the back yard of his city lot, at least in part with the waste/manure of a pet rabbit. Yes, it is apparently possible to nearly achieve self sufficient living on a city lot, especially with the help of animal-based fertilizer. After all, convenience was the mother of all those clean and tidy, bloodless, shrink-wrapped square pieces of meat on grocery shelves today. Thus, convenience robbed us of self sufficient living. If you’re willing to keep gambling on the stability of your employment and the global economy in exchange for the more familiar convenience, great! But you now know where to come (Raising-Rabbits.com) should self sufficient living become a greater (voluntary or involuntary) priority.